Framed vs Frameless Cabinetry | MTKC - MT Kitchen Cabinets, Inc. San Mateo, California. While all cabinets serve the same purpose of storage, different cabinet constructions provide an overall different look and feel. With the increasingly heightened awareness in fashion designs in the furniture market, many homeowners are looking for more refined, quality products to fit their detailed specifications, and make a fashion statement with their furniture-like kitchens and bathrooms. Since each cabinet construction has its own advantage(s), understanding the different constructions can often help in deciding the more appropriate cabinet for your home. The more commonly known types of construction would be: framed, frameless, and inset. Due to space limitations, this article will be exploring the difference between framed vs. frameless cabinetry. more rigid construction. Furthermore, in the event that less than ideal situations were to arise during an installation, framed cabinetry would allow more room for correction. It also tends to be more installation-friendly for amateurs and homeowners who are do-it-yourselfers. 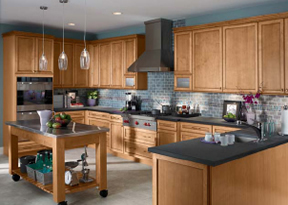 Additionally, framed cabinetry offers a more traditional, old world, elegant look that many home owners appreciate. Particularly, the solid wood face frame receives the same high-quality finish on the door, as opposed to the edge tape on top of the front of the side panels for frameless cabinetry. Frameless Cabinetry : As the name implies, frameless cabinetry differs from framed in that the cabinet has no face frame. It allows for full access to the interior storage space, making cleaning a much easier task to do. Frameless cabinetry, however, also comes with a certain association. In the traditional sense, the frameless cabinetry tends to be more affordable since less material is used. Today, however, frameless is usually associated with pricier European cabinetry, which typically ranges from $50,000 to $100,000 per kitchen, with three to six months lead time. The reason for the higher cost is largely due to the technologies involved in the more difficult manufacturing process for doors, as well as the almost endless amount of accessories and hardware. The amount of precision involved is very different from framed cabinetry, where doors tend to have larger gaps (smaller overlays) in between them. Frameless cabinetry has doors that almost fully cover the cabinet itself, leaving a very flushed look overall. So the elimination of the face frame works better for the contemporary styling that many younger families are looking for. It should also be pointed out that for similar quality, domestically manufactured frameless cabinetry would generally be more affordable compared to that of the European-imported lines, and the look of the European styling is not exclusive to European cabinets. Whether you are into the antique looks with elegant moldings and trim pieces, or the simple straight lines of a high-gloss slab door, MTKC is able to serve your needs. MTKC offers framed, frameless, and inset cabinetry in different styling, so please visit our showroom and meet with our designers. The above content was published in Home Digest Magazine in September 2006. For reference to the actual copy, please download this pdf file.